We really enjoyed our time at Brookes University. It was a fascinating experience and we learnt lots of interesting things. 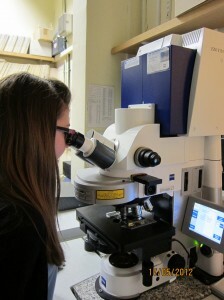 Our favourite part was when we were looking at the plant cells down the microscope. It was extremely fun changing the colours on the images to make pretty pictures. It made it easier to identify all the different parts of the cell and was also very entertaining. 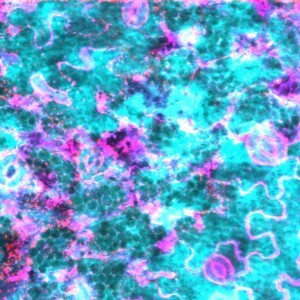 Golgi bodies (orange), endoplasmic reticulum (pink) and stomata. 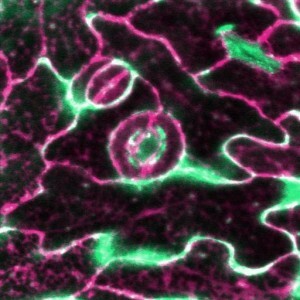 Endoplasmic reticulum (pink), Golgi bodies (green) and stomata! 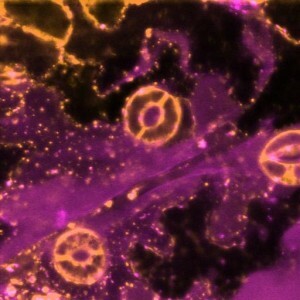 Image taken in different focal plane – so you can see chloroplasts (dark-green slightly elongated spheres). Video of Golgi bodies (red) moving over endoplasmic reticulum (yellow). 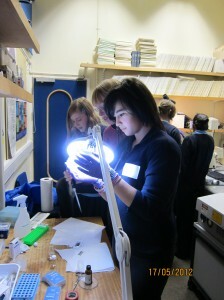 ← What happens when you let a small bunch of 14 year-olds loose with microscopes which are worth £250,000?